My name is Skya Fisher, and I am a Licensed Massage Therapist with my office in Bellingham, WA. I offer many styles of massage: Deep Tissue, Swedish, Reflexology, Traditional Thai Yoga Massage, Sports Massage, and Manual Ligament Therapy. I am also a Third Degree Reiki practitioner. Most sessions use a blend of these. Please ask if there is a style you are looking for, as I may know it. I have a background in dance and martial arts, and these disciplines have offered me opportunities to work with injury, and to discover healing techniques that work for most people. I practice Vipassana style meditation, which shapes the mindfulness I bring to my sessions. I like to work slowly and specifically, in rhythm with the breath, focusing on each unique being who seeks my help. I prefer not use music during sessions, but would rather incorporate breathing and sensory awareness as a way to reduce uncomfortable sensations, as well as teaching you some of your basic anatomy. Knowledge is power, and knowing what’s going on with your body as it’s happening is a powerful tool indeed. I am also a licensed Small Animal Massage Practitioner and Large Animal Massage Practitioner. I have a degree in Animal Behavior and over 20 years of experience working with domesticated and wild animals. 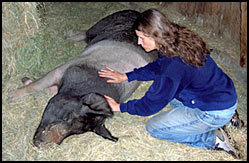 Animal massage therapy goes beyond merely petting an animal; there are specific techniques to reduce injuries and induce a calmer demeanor. 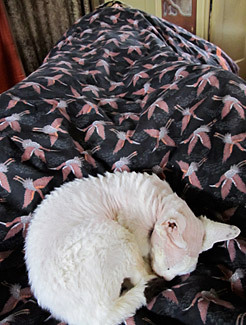 Animals enjoy the same benefits of massage as humans do. Cat Paws is focused on being Earth-friendly: all products are organic, biodegradable, not tested on animals, and most equipment is purchased used. I use only organic, unrefined coconut oil, which is one of the healthiest form of fat you can absorb (including rare medium-chain fatty acids), and it does not go rancid at room temperature. A session at Cat Paws is customized to what a client wants and needs, spanning the spectrum from pure relaxation to pure injury treatment. I mix a variety of techniques that relax muscle spasms, flush toxins through the circulatory system, and re-condition the nervous system’s holding patterns. A muscle in motion cannot remained clenched, so much of my work incorporates rocking, vibrating, and jostling to relax tissue tension. In addition to the common Swedish and Deep Tissue modalities, my continuing education has included Beginning Trager, Traditional Thai (Assisted Yoga), and Reflexology of the feet. Reiki is a form of hovering hands over the body to move energy in the body as needed, which many people find deeply relaxing, and this is included where appropriate. Guided imagery helps you learn to pay attention to sensations in your body, so that you can feel where tension may be lurking; you can cultivate this awareness in order to feel tension in “real time” as it arises, and it relax it before it turns into pain. I am also certified in Manual Ligament Therapy, a new cutting-edge modality that uses very slight pressure on specific ligaments in order to release holding patterns of correlating muscles. If you think of the brain as the Pentagon, then the ligaments are the generals, in control of communications. The muscles are just the foot soldiers, doing what they are told. We use the ligament system to re-issue “orders” from the brain, to reverse chronic muscle tension. Please see the Link below to read more about this effective new option, or call me to ask any questions. 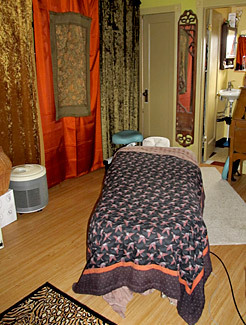 A session at Cat Paws Massage studio includes several free perks. I use an electric tilting table that can put a mild traction in the joints, especially the spinal column. This opens and decompresses the joints and allows more access to deeper tissues, giving your joints a little break from the pull of gravity. Some chiropractors use a similar device and charge for a session of being stretched, but you can enjoy this mild version of an inversion table every session. Many people find that this traction prolongs the beneficial results of a session. Some sessions include side-lying traction, for 360 degrees of relaxation. You also inhale a free dose of Bioactive Plant Fractions, which are misted into the air during treatments. Similar to a highly refined essential oil, the scientific properties of this remarkable medicine have been found to include boosting your immune system, lowering your histamine reactions (thereby reducing allergy symptoms for some people), and inhibiting mold and fungus growth in your tissues. Please see the Link below to read more about this interesting form of preventive medicine. For those who are interested, you can also book Tribble the Therapy Cat to come sleep on the table with you during a session, if he is in a suitable mood. Just ask for a reservation at the time you set your appointment. Please see below for my rates and policies. Please CLICK HERE for my massage intake form. Please CLICK HERE for my cancellation policy form. Horses are the primary focus of this practice, and have the longest history of receiving professional bodywork. Whether your horse competes in athletic events or is just your companion, s/he will enjoy the benefits of therapy. Massage can help correct uneven gaits, making for a smoother ride and stronger performance. It can increase range of motion of all joints, which means higher jumps, sharper pivots, and faster responses. Reduction of chronic aches leads to more confidence and comfort. Increasing circulation means less fluid build-up in the limbs from stalling and transportation. With overall relaxation comes improved digestion. The combined effects go towards preventing injuries from occurring in the first place. Psychologically, horses today spend a lot more time in restricted spaces with less exercise and can get bored. Massage gives them something to get engaged in, and something positive to associate with their stall. Other large animals that enjoy massage are alpacas and llamas, goats, and pigs. Whether working animals or companion pets, these animals will respond positively to loving touch. Dogs and cats share many of the same benefits of massage as large animals, especially more rapid recovery from injuries and general well being from having tissues “buffed and fluffed”. Dogs in particular, especially if they are competing in athletic events, can sprain muscles, tear tendons and ligaments, and suffer from overworked joints, all of which will usually improve faster with massage. Many breeds have been over bred for profit, and sadly suffer genetic defects such as hip dysplasia, hyperactivity, and obsessive-compulsive behaviors. Massage can help reduce the pain of misaligned joints and help calm the nervous system. Unnatural diets of dehydrated kibbles, especially those with chemical additives, can encourage tissue fibers to stick together and lead to reduced movement. Massage can encourage fibers to separate and break up scar tissue, as well as increase peristaltic action in the intestines and improve digestion by overall relaxation. If your companion is overweight, then s/he is working harder to carry around that heavy fat, and massage can help ease the burden on joints. As your companion ages, massage can reduce inflammation and pain associated with arthritic joints, and improve failing muscle tone. Full body palpation can also detect early signs of lumps, bumps, and abrasions that you might not notice through surface petting of your companion. Today’s society requires people to be busy, and companion animals rarely get a chance to do the farm-based work that most of they were bred to do, leading to boredom. Massage is one more interesting thing for your pet to experience. Animals are, in general, more “in their bodies” than humans are, but oftentimes they too can appreciate being reminded through touch that they are, for example, more sore on one side than the other. A calm dog has a better ability to focus on training tasks, too; a relaxed cat, however, usually wants to go to sleep! Dog and cat clients must be spayed or neutered. If you round up a dollar, you get to put the dollar into a Charity Jar, whose contents will be donated to a nonprofit organization at the end of each month. Insurance work is done in 60 minute sessions, and is billed accordingly. I accept Personal Injury Protection (PIP) and Labor & Industry, both of which require a prescription. I work by appointment, and can often take a same-day appointment. I am available Monday – Saturday, starting at 10:00 a.m., and last appointment times will vary. I do not conduct business online nor via text, only telephone. Please see my Contact information at the bottom to book an appointment. I request 24 hours of notice to cancel an appointment — and I offer the reverse policy, whereby if I cancel without 24 hours’ notice, you get an hour of free massage. Payment is due at time of service. 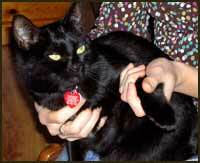 Cat Paws Massage accepts cash and checks; bartered services exchange an hour of my time for an hour of your time. I do not accept credit cards at this time. *** Please note that I am chemically sensitive and I ask clients to refrain from coming to a session wearing scented products including perfume, cologne, strong deodorant or shampoo, and strong laundry detergents. Thank you for your consideration. I charge by the session, because animals vary in their response to massage and some will need little breaks in the bodywork, and some will not tolerate prolonged work. In general, a horse will take between 45 minutes to an hour and a half, for which I charge $60. Dogs and cats are also charged by the session, which can vary from 20 minutes to over an hour. A session is $45 for dogs or cats. Multiple animal discount is two or more animals for $40 each, same or combined species. 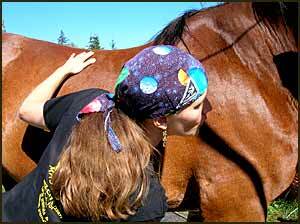 The boundaries of my services area to travel for animal massage are Bellingham City Limits. Outside of the city, there will be an additional travel fee of 50 cents per mile. Demonstration cat and dog will be provided; please do not bring your own companion. Tea and light snacks will also be provided. You will get a small workbook with a few pages for notes, but feel free to bring your own paper if you chose, and whatever you like to write with. We will be practicing massage techniques (fully clothed) on each other, so please wear comfortable clothes that allow good movement. If you are uncomfortable being touched, then this class might not be appropriate for you. We will all strive to provide a safe and caring environment for each other in which to learn. (360) 383-CATS (2287); registry is by phone only. Skya Fisher is truly the best massage therapist I have had the pleasure of working with. She is helping my body recover from an old injury. My work is very physical and I need to be in the best shape I can. Thanks! I was hit by a car while riding my bicycle in August 2010. The accident shattered my entire upper body. All the nerves were severed in my right hand and I have limited feeling in that hand. I have a plate in my upper left arm and extensive scarring between my vertebrae. By maintaining a vigorous exercise program and using multiple pain control modalities such as massage, hydrotherapy, and qigong breathing exercises, I have been able to steadily wean down my level of pain medication. I work and I even take an occasional bicycle tour. My life is more active than that of most uninjured people I know. Every two weeks, Skya Fisher loosens the knots and enables total relaxation. Skya makes it possible for me to get out there and live another two weeks. She manipulates my forearm and reduces the numbness in my hand so I can continue to type, write, and produce art for sale – Skya maintains the tool of my livelihood. Thank you for helping me eliminate caffeine from my diet. By doing this the sharp needle-like pains and hot flushing on my skin disappeared. Headaches are gone. Your encouragement provided the motivation to improve myself physically and mentally. Skya’s approach to my extensive shoulder injury has been sensitive, holistic, and frankly, far more effective for me than physiotherapy has proven to be. Her combination of visualization, relaxation, and manipulation of tissues — and her whole body awareness — is an incredibly powerful combination. Many do massage — few are therapists. The most caring massage I have ever experienced. What you are doing is much more healing than what doctors do. Ecopolitan is the umbrella organization for Dr. Adiel Tel-Oren, MD. This remarkable physician is also, among other things, a professor of nutrition, and a humanitarian who has founded orphanages that currently educate over 1,200 orphans in Nepal. I coordinated his local lectures for over two years and highly recommend everyone check out the information shared on this website. Dr. Tel-Oren has shared six hours of FREE nutrition lectures (see “The Truth About Your Food”) that explain some crucial information, and he debunks some common myths that will surprise you in this ever-changing field of study. For busy people, check out “Dr. T in Three”, little three minute blurbs about common health issues. As part of funding his schools for orphans, Dr. Tel-Oren provides a service of removing moles and skin blemishes that is non-invasive and non-scarring, which you can read more about here, and check out his lecture/treatment tour schedule to see when he will be in our area. See his full list of credentials, ecological projects, and photos of his most excellent raw organic restaurant, Ecopolitan. Donations to help the orphans are, of course, tax deductible. Three blends of these molecules are available in small, economical inhalers, as well as an ultrasonic diffuser. Much more detailed information is available in a pamphlet available at my office. To order from this site, www.plantextractsinc.com, go to “Buy Online” and go to pages 7 and 8 to see the list of products and refills. Put in my name as the distributor, Skya Fisher. Manual Ligament Therapy, created by Arik Gohl, which is one of the more recent techniques in which I am certified. This technique is so gentle that it can be used in treatments of even acute injuries, yet is so powerful because it works at the level of ligaments, not just muscle tissue. Mr. Gohl is part of the cutting-edge research on ligaments, which is discovering that ligaments are sensitive tissues that actually relay information to the nervous system, and can be manipulated by small amounts of pressure. This is the site for my recycled-content craft business, Bricolage Earth Friendly Crafts. This site is still being built, so please call me for more information until it is completed. Products will feature Honkerchiefs, the handkerchief of the 21st century, massage sewn supplies, and reusable cloth gift wrappings. This DVD is the story of a boy with progeria, the rare disease that causes accelerated aging. The unwavering good nature of this fellow is an example to us all, as we follow his life for four years. Last appointment times will vary. Please note that I am frequently in a session during business hours and will return your call promptly if you leave a message with your name and phone number. Thank you for your interest in Cat Paws Massage!